Hyderabad / Mumbai: An independent director of Satyam Computer Services Ltd continued to defend the company’s decision to acquire two companies controlled by Satyam’s promoters for $1.6 billion (Rs7,568 crore) even after the computer services firm scrapped the deal in the face of intense and angry investor protest. /Content/Videos/2008-12-18/1712_Rahul disco_Deal off_MINT_TV.flv99313ad6-cc50-11dd-8938-000b5dabf636.flv“We believed in it (the value-creating opportunity in the buyouts), not otherwise at all, " said independent director V.S. Raju, in a phone interview with Mint. The decision to call off the deal didn’t help Satyam’s cause, with the stock closing almost 30% down and brokerages and research firms releasing reports to their clients that termed Satyam’s act a “breach of trust" (ICICI Securities Ltd), and “daylight robbery" (Dolat Capital Market Pvt. Ltd). Deal or no deal, the “damage is done" said CLSA Asia Pacific Markets in its report. “Our only regret is the reaction and we didn’t anticipate it (opposition to the deal)," added V.S. Raju. 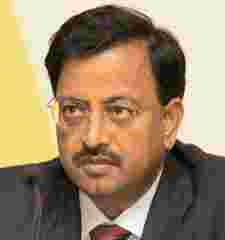 Three independent directors on Satyam’s board—Raju, a former director of Indian Institute of Technology, Delhi; retired bureaucrat T. R. Prasad; and M. Rammohan Rao, dean of Indian School of Business—attended the first meeting. Two others—Vinod Dham, who designed the Pentium computer processor, and Mangalam Srinivasan, an academic with stints in University of California at Berkeley, and Harvard—and Krishna G. Palepu, a professor of business administration at Harvard Business School, who serves the company’s board as a non-executive director, phoned in. Satyam’s chief operating officer Ram Mynampati and chairman Raju and his brother Rama Raju, who is managing director of Satyam, also sit on the board and attended the meeting. All the directors phoned into the second meeting to pull the plug on the transactions. Prasad declined comment. Rao could not be reached for comment on Wednesday. The directors based in the US also could not be reached by phone. Palepu is travelling and is currently in West Asia on business, his office said. Still, analysts say the directors have some explaining to do. “Despite Satyam’s reversal of its decision to buy out common promoter-owned realty and construction businesses, questions will linger on, perhaps for a long time," wrote CLSA analysts Bhavtosh Vajpayee and Nimish Joshi in their report. “Why did the board not oppose the move? Who voted for and against the resolution? Was the board truly independent?" Strong reaction: The cover image of this report put out by Mumbai’s Dolat Capital Market Pvt. Ltd and authored by Sanjeev Patkar, summed up the response of the analyst community. The Bombay Stock Exchange’s benchmark index, the Sensex, lost 2.6% on Wednesday. 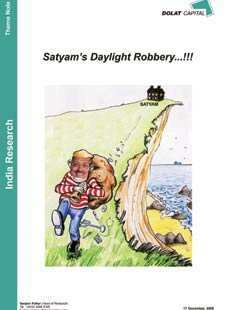 At a Tuesday evening meeting, seven of Satyam’s nine directors approved the decision to acquire Maytas Properties Pvt. Ltd for $1.3 billion and a 51% stake in Maytas Infra Ltd for $300 million, in a move that benefits Raju’s family that has promoted all three firms. Mynampati said the Raju brothers abstained from voting because they were “interested directors". The Raju family directly owns about one-third each in the two target firms, whose names are Satyam spelt backwards. On Wednesday, television channel CNBC TV18 ran a report that said the family’s actual holding in the firms could be much higher. Satyam didn’t spell out how the deal would be funded, but what outraged investors was that the family, with a 8.61% holding in the company, could potentially spend partly or fully its cash of at least Rs5,300 crore on deals that would blatantly benefit the family. Raju’s son Teja Raju is vice-chairman of Maytas Infra. The move, justified by the company management on Tuesday as part of a diversification strategy, particularly peeved investors because Satyam did not consider any other realty or infrastructure firm seriously. Analysts Viju George and Kunal Sangoi of Mumbai-based equity research firm Edelweiss Securities Ltd termed the entire Satyam event as “plumbing new lows in corporate governance". Local units of UBS Securities, JPMorgan and Credit Suisse noted that Satyam’s proposed deal violates corporate governance norms. Stunned by the opposition, reflected in an at least 50% fall in the company’s American depository receipts in the US on Tuesday night, Satyam went into damage control soon. According to Mynampati, to regain investor and stakeholders' confidence, the company is looking at share buybacks as an option to restore shareholder value, besides opening increased lines of communication with investors. Chief financial officer Srinivas Vadlamani insisted the board’s acquisition decision did not violate Satyam’s articles of association, a regulatory filing that sets out what all activities the company will engage in. The “omnibus" nature of the articles permitted investment in the infrastructure sector, he said. Asked whether a diversification into infrastructure would be revisited if investor confidence could be gained, Mynampati said it was too early to comment on this and that the company now needs “enough breathing space to reflect on" where it stands. Elsewhere, analysts did not hold back their anger. “During uncertain demand scenario, investors will always prefer companies with proven, high-quality corporate governance," ICICI Securities Ltd’s Sandeep Shah and colleagues wrote in a report. “Investors may insist on changing the senior management. We believe that with significant institutional investor holding (at >45%) the investors may urge a change in the senior management, which may lead to some corporate events such as the acquisition of Satyam." Kotak Securities Ltd analysts Kawaljeet Saluja and Rohit Chordia, who suspended rating of Satyam stock, wrote in a report: “We believe that the reputation damage in the minds of all the major stakeholders—non-promoter shareholders, who hold more than 90% of the shares, employees, business partners and clients—would be difficult to undo." Despite the company cancelling the proposed measure, the Satyam “stock continues to languish below book value," noted Manik Taneja, equity research analyst at domestic brokerage Emkay Global Financial Services Ltd. This is the second instance of investor agitation reversing corporate strategy among large Indian companies. Recently, the street opposed Sterlite Industries (India) Ltd’s restructuring exercise, which was seen as harmful to shareholder’s interest.